Carpal Tunnel Syndrome and Repetitive Strain Injury have become watchwords of offices since the advent of the personal computer. 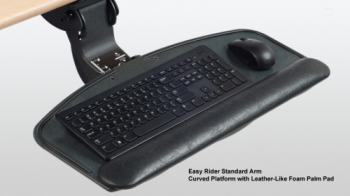 Adjustable keyboard systems are essential tools to reduce workplace injury: by with a fully adjustable surface, employees can ensure that they are keyboarding in the ergonomically correct position. Easy Rider arm allows employers to give all users fully-featured adjustable keyboard systems at an affordable price. 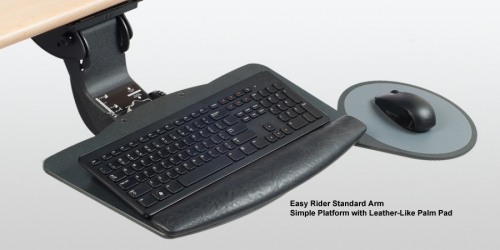 The Easy Rider arm can be adjusted without levers for smooth height transitions. The unique soft-touch wheel adjusts platform tilt with each turn. Both height and tilt are separately visually displayed for ease of reference. 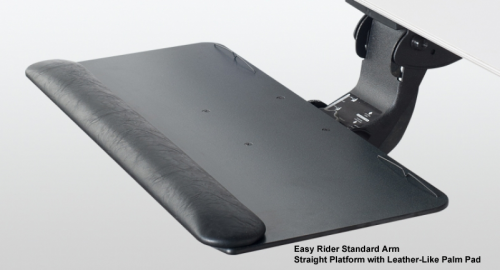 Easy Rier Standard is available in ISE’s extensive range of platform shapes for all applications and worksurface sizes. It is available in a single surface for keyboarding and mousing or with a range of separate mouse supports (retractable, tiltable and swappable). 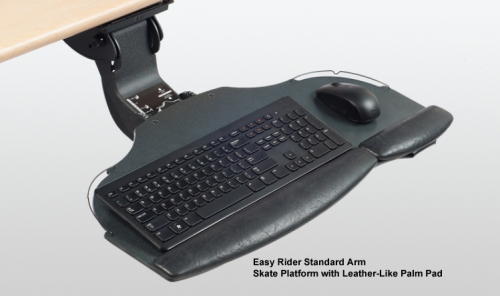 ISE’s unique universal platform shape accommodates standard or curved Microsoft Natural keyboards.